It was a pleasure spending some time on Election Day as the guest speaker for the Temple University Chapter of the Public Relations Student Society of America. Chatting with students about career experiences and the many changes I’ve seen in both the pro sports and legal professions over the years is always a lot of fun. The audience was attentive and certainly inquisitive. The PRSSA is the leading pre-professional organization for students interested in public relations and communications. With over 300 chapters and 10,000 members nationwide, PRSSA offers members countless opportunities to succeed. 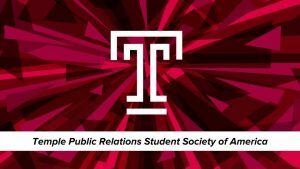 The Temple Chapter of PRSSA is the longest standing chapter in the Philadelphia region, and currently consists of over 120 members. In providing a rundown of my career, I discussed the good moves and bad ones, relayed some unprintable anecdotes (if you do not tolerate some profanity, you really cannot work in sports…perhaps even the legal industry), tips for internship and job searches, and the many, many changes in both the sports and law worlds over the years—and the related ways it has changed the PR and marketing functions. More than anything I focused on how important relationship-building has been to my life and career (I’m not talking about LinkedIn or Facebook, but those in-person, personal contacts). My “boss” as a Philadelphia Flyers PR intern in 1984—Mark Piazza—remains one of my dearest friends in 2016. And that was just one example of key relationships that went as far back as high school internship experiences with the minor league Baltimore Clippers and the MISL Baltimore Blast. Mark happened to be a Temple Owl as were other important folks I met along the way, people like Ed Waldman at The Baltimore Sun and Marc Zumoff with the Philadelphia Fever. Temple Owls are everywhere. The alumni network is a powerful thing. Thanks to Temple PRSSA chapter president Kim Leung for the speaking invitation. Coincidentally, she is presently a Communications Intern at the Philadelphia Bar Association, working with fellow Temple alum Meredith Avakian-Hardaway. Among the many inquisitive students that had great questions was Clarissa Ford, author of a blog entitled She Knows the Rules—referenced as the ultimate fan girl’s blog to all things sports. Many of the attendees asked for business cards, LinkedIn and Facebook connections, followed up with personal e-mails and stayed to ask a variety of questions—all showing they were listening to my message. Micah has used his experiences at Temple, both as an undergraduate in SMC (B.A., 1981) and law school (J.D., 1991) throughout a career in public relations, journalism, marketing and the law. 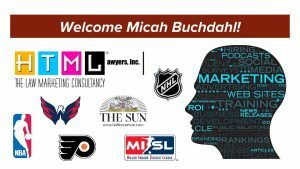 His PR internship with the Flyers as a Temple senior was a significant event that served as a launching pad to many opportunities and key relationships that are of both personal and professional importance in his life today. His work experience includes positions with the Philadelphia Flyers and Washington Capitals in the National Hockey League, the Major Indoor Soccer League, National Basketball Association and The Baltimore Sun. After hybrid marketing/legal positions as an attorney (with the Flyers and NBA), he shifted his focus to working in the legal profession as an attorney assisting law firms with marketing and business development efforts. Throughout his career, public and media relations functions have been a core component to his responsibilities and success. For more than 15 years, he has run his own law marketing consultancy, HTMLawyers, Inc.
A longtime supporter of Temple, Micah and his wife Ivy are Conwell Society members. Together with his son Ben, 8, and daughter Lily, 12, they attend dozens of Temple football and basketball (men’s and women’s) games each season. His nephew Max is a junior at SMC. The Buchdahl family resides in Moorestown, New Jersey. Thanks again for having me visit and spend time at a place that certainly holds a special place in my heart—the main campus of Temple University and the School of Media and Communication. Go Owls!